South Africa’s premier independent arts and culture funding and development agency has played a strategic role in the development of arts and culture in South Africa since its establishment in 1994. Over the past 23 years, ACT has been growing trust in the arts through its efficient and responsive implementation of a range of activities that have made a meaningful contribution to the dynamism of the creative sector. ACT’s consistent steady growth, good governance and financial management track record have made it a partner of choice for a range of growing sponsors. “Not being afraid of change has served the Trust well over the years and we’re not going to start resisting it now,” says Pieter Jacobs, CEO of ACT. “In order to remain relevant and to ensure that the Trust’s investment in the arts has the biggest possible impact, it is vital to reflect and adjust where necessary,” he adds. In addition to the restructuring of a number of programmes, moving into its own premises by the time the Trust celebrates 25 years is among the ambitious plans for the next five years. To ensure equitable disbursement of funds to all arts disciplines and regions across South Africa, for the next five years ACT will change the grant-making programme drastically. The Trust’s funding programme will consist of three major aspects with a focus on the development of arts and culture in under-served regions, post-graduate studies in the fields of arts journalism and arts management and underwriting of feasible creative projects. “Grants to the value of more than R23 million were disbursed to more than 800 projects since 1994, and with this new direction ACT hopes to rectify the slight imbalance in the allocation to certain regions and disciplines,” says Jacobs. 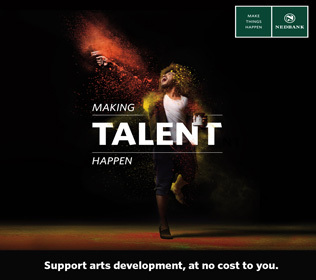 Since the inception of the Scholarships Programme in 2009, more than R2.3 million has been invested in the careers of young aspirant performing artists. This programme has also undergone a shake-up with it now catering for after-school discipline-specific studies and training across disciplines. In addition to hosting musical theatre auditions, participants interested in pursuing a career in specifically acting, singing and dancing will be able to audition for those only without having to demonstrate competence in other disciplines. Through the annual ACT Awards, the Trust celebrated more than 150 individuals and groups who have made a meaningful contribution to arts and culture in South Africa. Among those are icons such as Miriam Makeba, Nadine Gordimer and John Kani. For the first time since the launch of the Awards in 1998, a limited number of tickets will be made available for purchase. At the same time, the format of the event has been reinvented. In addition to a stellar line-up of entertainment and five-star hosting, guests will enjoy a talk-show format with the winners. 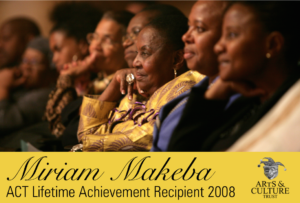 “Since we’ve shifted focus to the acknowledgement and celebration of the stalwarts of the local creative sector in 2008 by increasing the number of Lifetime Awards allocated, their acceptance speeches have become the highlight of the event. We believe that the new format will maximise the opportunity to get to know these icons and their stories,” says Jacobs. For more information visit www.act.org.za.